Many people hold very strong prejudices towards people who have committed crimes and have been put into the prison system. I have heard personally a lot of people say that it is a lost cause to try to rehabilitated them, because they will just go back to their old ways as soon as they are released. It is true that a lot of convicts, once released, will go back to their old ways, see the same people that they did when they got locked up, etc. Soon enough they are committing the same acts that they were before and get put back into the system. What if we could teach them and give them the tools that could make them want to change when they got out? To be able to simply observe their emotions and not necessarily act on them? Teach them love and compassion towards all people, instead of being trapped by fear and ignorance? Fleet Maull believes that this is necessary in the rehabilitation of convicts, being an ex-convict, he understands the hell that is being locked up for “storage” in a prison simply to be released later without the help that can help the prisoner not return in a few months or years. Maull was sent to a federal prison to serve a 14 year sentence for drug-trafficking, ever since his release he has been helping other prisoners get the tools that they need to be able to develop a practice and in the end help them make peace with their troubled past and be able to heal and move on. 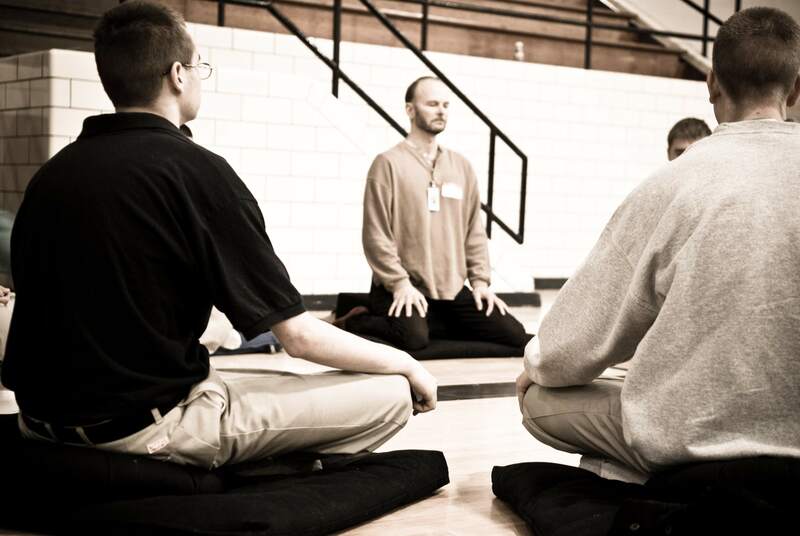 Since the creation of the Prison Dharma Network, Maull has started a book program for inmates, and also a pen pal program with dharma mentors (these people give little of their time to send letters to inmates talking about their practice and giving them help on how they can continue their practice while they are still in the prison). This small act of writing a letter, which is maybe about 30 minutes of your time, has such an impact on the inmates lives, mail time is so important to the inmates and even more precious when they receive a letter from someone on the outside. Little acts of kindness and compassion like this one, can have a deep and positive impact on the inmates. You might not think that you can dedicate your time and energy to have a constant relationship with an inmate or feel that you might not know enough about the dharma to help them. The book program is an easy way to help, it only take a minute and for a small donation you will be able to give someone who really needs guidance, a book that can help them find the tools that they will need to heal and learn how to change their relationship to their emotions. The change that can occur in someone when it is them that discover the means to change is truly powerful and lasting, movies like Doing Time Doing Vippassanna and the Dhamma Brothers are proof of the possibility of change and rehabilitation. It is important to support such organizations like the Prison Dharma Network to hopefully help change society’s view of convicts and the possibility of giving these people a second chance to a life outside in the world with their family and friends. If this interests you, get a hold of the Chaplain of the nearest penitentiary in your area and start a sitting group with the inmates, it may just be one of the most rewarding things that you will ever do! Highschool can be rough for a lot of people, it is a time where we discover who we are, that is hard enough that we should not have to also be victims of bullying because of who we are. On the Day of Silence hundred of thousands students will take a vow of silence to bring attention to anti-LGBT name-calling, bullying, and harassment that happens in schools all over the country. Unfortunately, thousands of kids are victims of this, and it always passes in silence. This is why the slogan of The Day of Silence, is “what are you going to do to end the silence?” This is an issue that must be confronted and brought to the attention of people, awareness and education is key to ending this. It is hard to believe that in this day and age, that people are still victims of such horrible events. 5: A woman’s period is disgusting and unclean and anyone who comes near her is guilty of sin. LGBT rights has been one of the most publicized human rights issues in the last years, and this momentum must continue if it is to end and to come out victorious in this fight for equality. Social perceptions take time to change, but this fight is always necessary and must not give up till it is over. There will always be some narrow-minded fearful people out there, but as long as everyone is protected by rights to be able to live their lives as they see fit, we can live in a more peaceful, compassionate, and understanding society. That is what is key here, to simply see everyone as equal, and having respect for everyone’s right to live their lives as long as they do not inflict pain and violence towards others. The Day of Silence campaign is a great action, if you are involved in a highschool or college, please register your school and partake in this day! (http://www.dayofsilence.org/index.cfm) Only we can end this silence by being united and educating people! This post in memoriam of Carl Walker-Hoover, he took his own life on April 6th 2009. He was the victim of constant bullying, this includes anti-LGBT bullying. He did not identify himself as gay, but this helps us to remember that anti-LGBT bullying affects all people. He would of been 12 for this year’s Day of Silence. What are you going to do on April 16th to end the silence? In 2007 a groundbreaking documentary, The Dhamma Brothers, came out and helped show the transformative power of meditation. Jenny Phillips shows us a meditation program that takes place at the Donaldson Correction Facility in Bessemer Alabama. The documentary closely follows four of the inmates that took part in the program, all doing time for murder. Throughout the film we get commentaries from the guards, prisons officials, and local residents. At first, there is a strong sense of pessimism towards the program, but with time they all see the transformation that takes places and the positive effect that it has on the prison population. Donaldson is known as being an extremely violent corrections facility, it is hard to imagine how one is able to come to terms with their past and let go of their violent pasts, when violence seems to be their only option for survival. It is a true gift for them to be able to withdraw from this world and have time for inner reflection and the work that needs to be done in order to find peace, even behind bars. Seeing as how this program takes place in the heart of the bible belt, some people state many negative things about Buddhism, even comparing it to witchcraft. However, the transformation that we witness is truly inspiring and amazing, seeing criminals finally have the tools to be able to find their own solutions to make peace with their troubled past. This is a great North American take on the documentary that came out ten years prior to its release, Doing Time Doing Vipassana, which examines the large-scale meditation program at Tihar prisons in India. 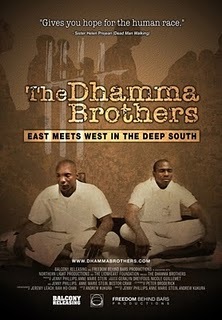 The movie was such a success that a book was released a year later, The Dhamma Brothers: Meditation Behind Bars, which publishes the letters that were exchanged with the meditation teachers and of course the director Phillips, during and after the release of the documentary. I have had the privilege to participate in such programs in my area, and truly feel that this should be a cause that all people should support. Most prisoners feel like they have been put into storage till the day that they die, or are released into the general population still as lost and confused as they were when they entered. This practice gives them tools to be able to deal with the many difficulties that they will live when they try to build a new life for themselves. There are more and more of these types of program being set up in different prison networks, The Dharma Prison Network, The MBA Project, etc. Lets keep it going! Get in touch with your local government to see if such a program does exist, and if not, to encourage them to get one in place. I am about to go back into the prison and meditate with the inmates, and I feel truly blessed to have to opportunity to share the dharma with people that really need it! Discussing kindness and forgiveness towards others and especially themselves, instead of focusing on survival by greed, ignorance, hatred and delusion. Letting them go against the stream in a sea of violence, remorse, and hatred. Here is the new video for the upcoming album, Survival Story, by the Flobots. This song include Tim from Rise Against on vocals. Flobots are a band that uses their music to induce social change, and this song is no different. It is a mix of many different styles, but with a very unified theme, peace. What’s your plan go to do with me? Here is a video of Kerry Washington reading a speech originally given by Sojourner Truth during a public reading of Howard Zinn’s A People’s History of the United States. Very inspirational woman and speech! Seeing as international woman’s day is tomorrow, I thought that my first post should be about one of my favourite female voices in American history. Emma Goldmann was introduced to me in the writings of Howard Zinn, she showed me a vision of anarchy that spoke volumes to me. She spoke of issues like women’s rights, anarchy, patriotism in way that I had never heard before. She has been credited in playing a pivotal role in the development of political anarchist philosophy in North America and Europe in the first half of the twentieth century. She was born in Kovno in Lithuania, she emigrated to New York in 1885 she quickly joined the anarchist movement that was already present. She became known for her writings, speeches, and her many arrests for inciting people to riot and the illegal distribution of information about birth control (which is a direct violation of the Comstock law). She was also arrested and imprisoned for two years in 1917 for inducing people not to register to the newly instated draft. Once she was released from prison she was deported to Russia, she was at first supportive of the Bolshevik revolution but became critical of their use of violence and repression against independent voices. She then went to Spain to support the anarchist revolution during the Spanish civil war. She passed away in Toronto in 1940. She did distance herself from first-wave feminism and its effort towards women’s suffrage, instead she developed new ways to incorporate gender politics into anarchism. We should not believe that because she was hostile to first wave feminism that she did not do anything for women’s rights. She challenged patriarchy as a hierarchy that had to be challenged alongside state power and class divisions. 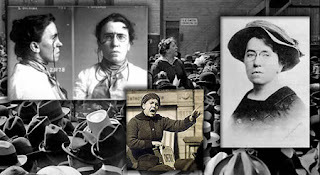 Emma Goldman was trained as a nurse and was a strong advocate for educating women concerning contraception. She believed abortion to be a tragic consequence to social conditions, and birth control as a positive alternative.She challenged many positions on ideas that were status quo during her time: homosexuality, prisons, free speech, atheism, women’s rights. I recommend that everyone take the time to look at the transcripts of speeches that she gave, and also her books and biography. She has been a powerful force in the anarchist and feminist movements since her resurgence in the 1970s, she is a voice of a true patriot!